Z marks the spot at Balaclava Station, and you’ll find the not-so hidden treasure on Platform 1. In 1996 two men found $200,000 in a drum buried beneath one of the platforms at Balaclava Station. The local men handed the drum into the police and the find was reported in the media. Probably spurred by the report, another eager digger, in the same week, found a second drum under the platform containing a similar amount of money, which was also turned into the police. For whatever reason, and we can only imagine, no one claimed the money and both ‘finders’ were granted ownership of their loot. Of course, this is not an incentive to go digging up train stations, and the men in question were also ‘found’ to be ‘trespassers’ on account of the land being owned by the Public Transport Corporation. But, lucky for us there’s no need to go digging for treasure anymore at the historical Carlisle Street transport hub. The treasure is now much easier to covet – and you’ll find it atop of the platform in the hands of the skilled baristas at Cofezo platform café. Balaclava Station was built in 1859 and has served as a railway portal from the inner city to the seaside (the end of the line being Sandringham) ever since. Having undergone a few renovations in its days, the most recent in 2014 was when Cofezo rooted itself firmly on platform 1 – the city bound side of the railway station. At the completion of the 2014 upgrade, Balaclava Station was elevated to a ‘Premium Station’ – meaning it has all the premium amenities and is staffed from first train to last. The most important station staff in our eyes are not even employed by the Transport Corporation however, but by owner/operator of Cofezo, Alvin Teh. Tom and Dave are the two main baristas at Cofezo, and together they are a team to be reckoned with. Hurtling through kilos and kilos of Zest’s Corcavado(Brazil, PNG, Peru) before most of us open our eyes in the morning. The Cofezo team start their grind just before 6am weekdays serving the early commuters with some of the finest platform coffee you’ll ever have. I even contemplated a 30-minute, dual-train detour one morning just to have these guys make me my first cup of the day. Yep, it’s that good. 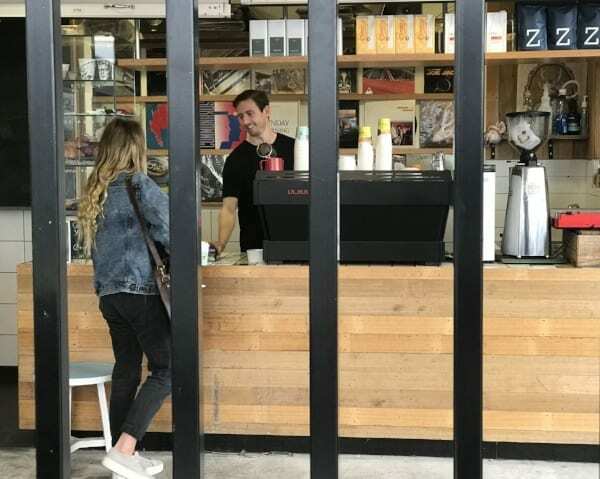 But, you don’t see any pressure on either of these barista’s faces you just see smiles. As the lattes and espressos fly into their eager patrons’ hands the boys let off some steam while the train takes off and the platform clears, with just enough time to flip the record before the next group come flooding up the walkway. 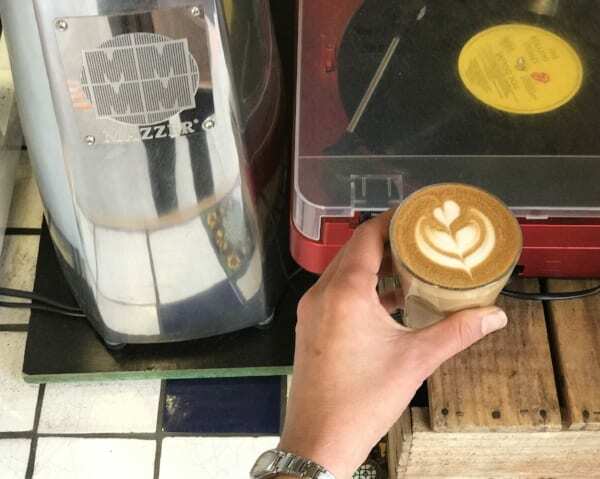 Like many of us Zestys and a few of our other favourite cafes (VMM), the team at Cofezo are music lovers. The back wall of the café plastered with some of the most classic vinyl albums ever to be spun, and they’re not just for decoration, they’re all functional. 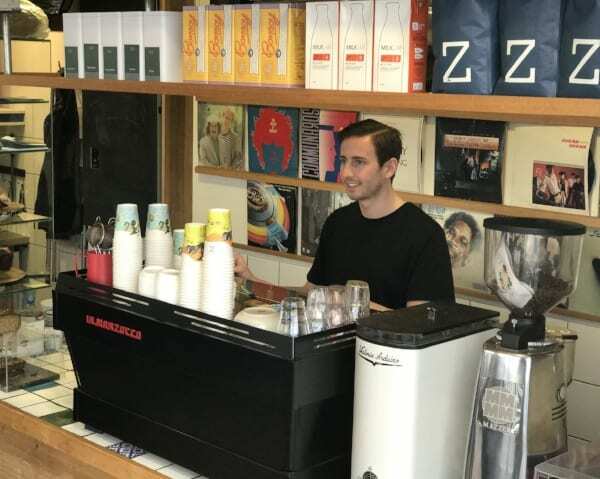 The same way you will always see the grinder humming, you will also always see the record player spinning – which sits snug next to the2 busy grinders – The Victoria Arduinowhirring through the mountains of fresh Zest Corcavadoand the Mazzer housing a circulating Zest microlot. Today it’s displaying our current lot from Kenya, the Githongo. And today the record player is spinning The Rolling Stones, Tattoo You, at my request. The well appointed platform café has a very small kitchen so it means as well as all the amazing pastry treats from Noisette Bakery glistening from the display cabinet, the cafette also offers up something a little more #hashtag-health in the way of Greek yoghurt for your morning fuel. Handsome Tom hands me another Corcavado latte (because they are just that good) as a city bound train pulls up and the new queue of Zest lovers take their position. I contemplate moving suburbs and giving up my car as ‘Start Me Up’ has me strutting the city bound platform, rooster-like with my Z-cup in hand and a skip in my step, while Mick Jagger’s staccato rings in my ears, reminding me what a good coffee can do.